Learn to how recognize the signs of anaphylaxis. Peanuts are the leading cause of food-related anaphylaxis in the United States. The most important and most powerful peanut allergy survival skill you can learn is how to recognize and treat anaphylaxis. Anaphylaxis is a life-threatening allergic reaction. Much more than just sneezing or a few itchy hives, anaphylaxis can cause dangerous, life-threatening symptoms, including a steep drop in blood pressure and/or swelling of the airways, both of which can cause damage to vital organs and prevent oxygen from reaching the brain. 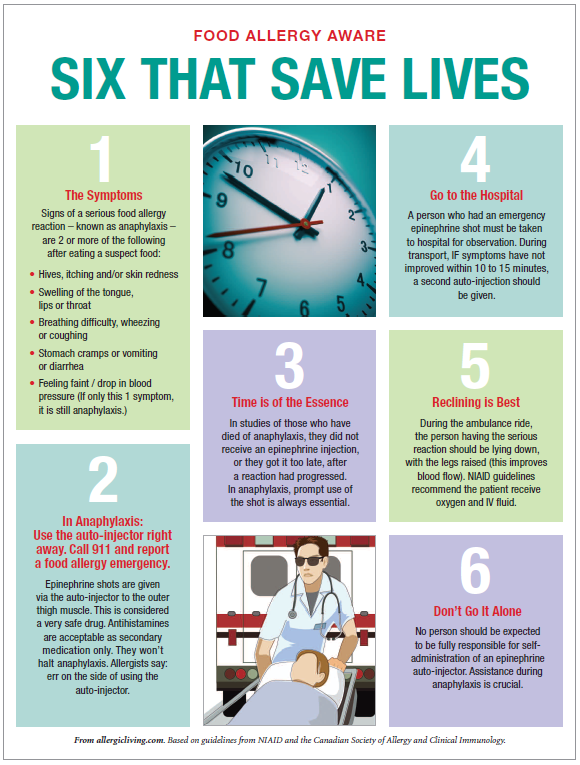 This free educational anaphylaxis poster from Allergic Living outlines the symptoms of anaphylaxis and explains the basics of how to treat it until emergency help arrives. Anaphylaxis doesn’t always look like the “allergic reactions” you may have seen on TV or in movies. Common visible symptoms of anaphylaxis include dizziness, disorientation or loss of consciousness (from the drop in blood pressure), stomach upset, vomiting, diarrhea, wheezing, coughing, and swelling of the lips, throat or tongue. In extreme cases a person’s lips and fingers may start to turn blue from lack of oxygen. Although hives are a common in anaphylaxis, it is possible for a person to go into anaphylaxis without obvious hives. Although facial swelling is also common, it is possible for a person to develop swelling in the airways before swelling in the face. Do not ignore other signs of a severe allergic reaction just because hives or dramatic facial swelling are not present. If any two major organ systems are affected by anaphylaxis symptoms, anaphylaxis may be present. So if a person with a known food allergy has hives and breathing difficulty, think anaphylaxis. If a person with a known food allergy has hives and vomiting, think anaphylaxis. If a person with a known food allergy is vomiting and feels faint, but has no hives, recognize that vomiting and dizziness alone might still be signs of anaphylaxis. The first-line, best medicine for the treatment of anaphylaxis is epinephrine. If you suspect that a person with a known allergy to peanuts is having an anaphylactic reaction, you should administer epinephrine as soon as possible. Many people, including, unfortunately, some EMTs and doctors who are not allergy specialists, believe incorrectly that over-the-counter antihistamines like diphenhydramine (aka Benadryl) should be given first to a person suffering from a severe allergic reaction, and that epinephrine should be reserved only for cases where antihistamines fail. This is an outdated and dangerous idea. It is not the protocol that top health organizations like the American College of Allergy, Asthma and Immunology recommend. Epinephrine works best when administered at the first sign of a severe allergic reaction. Because antihistamines like Benadryl can temporarily relieve minor allergic symptoms like itching and hives, they can actually in some cases mask the signs that a severe allergic reaction is getting worse, leading the person suffering the reaction and/or the people treating the reaction to believe that the use of epinephrine can safely be skipped or delayed. When it comes to stopping anaphylaxis, every minute counts. Delaying the use of epinephrine by as little as 20 minutes can have fatal consequences. The side effects of epinephrine are much less dangerous than the potential effects of anaphylaxis. It is better to use epinephrine in a case where it might not have been needed than fail to use it when needed. Acquire at least two epinephrine autoinjectors. Learn how to use them. Keep them accessible at all times. 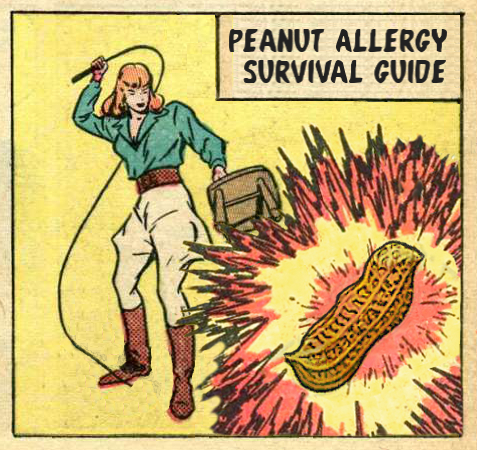 Maybe you have already experienced anaphylaxis from peanuts. Maybe you haven’t. But if you have been diagnosed with a peanut allergy, for the purposes of deciding whether or not to carry an epinephrine autoinjector, your previous history of reactions doesn’t matter. Because the truth is, every single allergic reaction happens under different circumstances. A number of different factors can influence the severity of an allergic reaction to food: how much of the food was eaten? Was the food eaten alone or with other food? Was the food cooked or uncooked? Was the person with an allergy sick that day? And it’s common for food allergies to change in severity over the years; a person with a food allergy can become more sensitive or less sensitive over time. The severity of previous allergic reactions to food does not reliably predict the severity of future reactions. And peanuts cause more life-threatening allergic reactions than any other food. All people with a known peanut allergy should consider themselves to be at risk for life-threatening anaphylaxis. Let me repeat that, just to make sure you got it: all people with a known peanut allergy should consider themselves to be at risk for life-threatening anaphylaxis. If a doctor has given you a prescription for an epinephrine autoinjector, such as the EpiPen or the Auvi-Q, then you need to fill that prescription and carry the injector. At all times. If a child with an allergy is too young to self-carry his or her own medication, a trusted adult should do it for him or her. At school, epinephrine should be stored in a place where a child with a peanut allergy can have access to it in five minutes or less. That means that a locked cabinet in an office far from the child’s classroom is not a good place to store epinephrine (despite what school staff might try to tell you). It should be kept somewhere that is easily accessible, and taken with the child on field trips, trips to other school buildings, etc. Epinephrine needs to be kept within a certain temperature range to maintain potency. This means you may need to keep it in an insulated case when outdoors on particularly hot or cold days. Seriously: if a five-year-old can learn to use an EpiPen, you, reader, have no excuse not to. You can also find simple printed instructions on the EpiPen itself, or at the EpiPen website. Another commonly prescribed epinephrine autoinjector, the Auvi-Q, actually talks to you and tells you how to use the device. Really! People with a needle phobia (it’s okay to tell me — I have one too, actually), take note: A safety cap covers both of these devices before use. The needle is hidden inside the device until use. After an EpiPen brand autoinjector is used, a special plastic cover pops out immediately to cover the needle. Auvi-Q needle fully retracts back into the device after use. This means that if you use these brands of autoinjectors properly, you never even have to see the needle inside, and there is no risk of accidentally stabbing yourself with the needle after the device has already been used. The EpiPen and the Auvi-Q both come with needle-free training devices you can use to practice using the devices yourself and also to train others. In my experience it takes 15 minutes or less to teach someone how to use an epinephrine auto-injector correctly. There are also generic versions of epinephrine autoinjectors available, but they do not share the advanced safety features of the EpiPen and Auvi-Q; the needle is usually exposed after use. For this reason I would recommend using a brand name autoinjector, at least until the generic devices improve. After using an epinephrine autoinjector for anaphylaxis, call 911. After a person has been injected epinephrine for an allergic reaction, that person should always go straight to the hospital, preferably via ambulance (a person who is having an allergic reaction should not drive him or herself to the hospital– see the dizziness and loss of consciousness symptoms mentioned above!). This is not because epinephrine is a dangerous drug. Epinephrine is safe to administer at the doses provided in autoinjector. A person who has been injected with epinephrine for suspected or confirmed anaphylaxis should go straight to the hospital because anaphylaxis is dangerous, and a single dose of epinephrine might not be enough by itself to stop a reaction. More epinephrine, antihistamines, steroids, oxygen, or other interventions may be required. Studies show that up to 20% of people who experience anaphylaxis will require more than one dose of epinephrine to recover. In many of those cases, the second dose is delivered in a hospital. But just in case help does not arrive in time, allergists now recommend that people with life-threatening food allergies carry two epinephrine injectors. If the first dose of epinephrine does not result in improvement after 15 minutes, it’s a good idea to use the second dose. Also, sometimes a person will seem to recover fully from an anaphylactic reaction and then suffer a relapse of allergic symptoms several hours or even a day or two later. This is called a biphasic reaction and it may require further treatment including epinephrine, antihistamines or steroids.